The global lighting industry is facing unprecedented challenges and exciting opportunities with the transition to new efficient lighting technologies. The industry is continually evolving, reinventing its approach to lighting to meet the needs of the 21st century. MELA will unify the strengths of the industry aiming to become the main platform for development and communication of industry positions in the Middle East region in support of regulatory initiatives. MELA has five founding members who are producers of light sources, luminaires and lighting control gear. The MELA founders are: GE Lighting, Gulf Advanced Lighting LLC OSRAM Middle East FZE, Philips Electronics ME & Africa B.V (Dubai Branch) and Tridonic Middle East FZE. These companies supply over 50% of the lighting products in the region today. 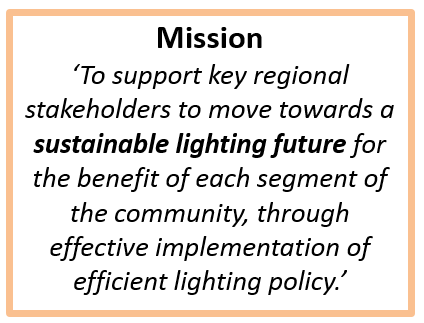 To support key regional stakeholders to move towards a sustainable lighting future for the benefit of each part of the community, through effective implementation of efficient lighting policy.